Belina's Adventures: Great Food.... Great Taste.... Easy Too! Great Food.... Great Taste.... Easy Too! Among the most favored and world over shared dishes in Italy is Lasagna. This dish can be done simply or so elaborate it will take you most of the morning to assemble, yet it need not become something you put off making because it's a lot of work and instead (and I'm all for this) making a simpler recipe is a great idea which will reward everyone with serving this lovely dish to friends and family more often. Like always, here's some interesting background on this dish: The word lasagna, which originally applied to a cooking pot, now simply describes the food itself. Although the dish is generally believed to have originated in Italy, the word "lasagna" comes from the Greek λάσανα ( lasana) or λάσανον (lasanon) meaning "trivet or stand for a pot", "chamber pot". The Romans borrowed the word as "lasanum", in Latin, meaning "cooking pot". The Italians used the word to refer to the dish in which lasagna is made. It wasn't long before the name of the food took on the name of the serving dish. There are so many variations of this dish it can be tailored for anyone's tastes. As in Itatly, with a meat sauce or just plain tomato sauce (plain? simple yes, but never plain..), bechamel is also used especially with vegetarian versions or even fish or seafood ones; chicken, you name it lasagna can adapt to it. I've also seen Mexican versions or Asian inspired ones, the list is endless. So go ahead and create your own version of Lasagna based on your own taste too! Preheat the oven to 375 degrees F. Bring a large pot of water to a boil with 1 tbl salt and a splash of oil. Add the lasagna noodles and cook for 10 min, stirring occasionally until done. Drain and set aside. For the white sauce, bring the milk to a simmer in a saucepan. Set aside. Melt 8 tbl (1 stick) of the butter in a large saucepan. Add the garlic and shallots, stir fry for 1-2 min. Add the flour to this and cook for 2-3 min over low heat, stirring constantly with a wooden spoon. Pour the hot milk into the butter-flour mixture all at once. Add 1 tbl salt, the pepper, and nutmeg, and cook over medium-low heat, stirring first with the wooden spoon and then with a whisk, for 3 to 5 min or until thick. Set aside off the heat. Separate the mushroom stems from the caps and discard the stems. Slice the caps 1/4-inch thick. Heat 2 tbl of oil and 2 tbl of the butter in a large (12-inch) saute pan. When the butter melts, add half the mushrooms, sprinkle with salt, add half the wine and cook over medium heat for about 5 min, until the mushrooms are tender and they release some of their juices. If they become too dry, add a little of the wine. Toss occasionally to make sure the mushrooms cook evenly. Repeat with the remaining mushrooms and set all the mushrooms aside. Scrape the bottom of the pan so you don't miss anything and let the mushrooms absorb some of the wine, just for a minute. Mix the grated Parmesan and Fontina and have ready. To assemble the lasagna, spread some of the sauce in the bottom of an 8 by 12 by 2-inch baking dish. Arrange a layer of noodles on top, then more sauce, then 1/3 of the mushrooms, and 1/4 cup of the grated Parmesan/Fontina mix. Repeat 2 more times, layering noodles, sauce, mushrooms, and Parmesan Mix. Top with a final layer of noodles and sauce, and mix in the Panko bread crumbs with the remaining Parmesan Mix and spread on top. Bake the lasagna for 30 min covered, then uncover and bake another 15 min or until the top is browned the sauce is bubbly and hot. Allow to sit at room temperature for 15 min and serve hot. Preheat the oven to 400 degrees F. Heat the olive oil in a large (10 to 12-inch) skillet. Add the onion and cook for 5 min over medium-low heat, until translucent. Add the garlic and cook for 1 more min. Add the sausage and cook over medium-low heat, breaking it up with a fork, for 8 to 10 min, or until no longer pink. Add the tomatoes, tomato paste, 2 tbl of the parsley, the basil, 1 1/2 tsp of the salt, and 1/2 tsp pepper. Simmer, uncovered, over medium-low heat, for 15 to 20 min, until thickened. In a large pan with water, salt and oil. Add the noodles and allow them to cook until done. Drain and reserve. In a medium bowl, combine the ricotta, goat cheese, 1 cup of Parmesan, the egg, the remaining 2 tbl of parsley, remaining 1/2 tsp salt, and 1/4 tsp pepper. Set aside. Ladle 1/3 of the sauce into a 9 by 12 by 2-inch rectangular baking dish, spreading the sauce over the bottom of the dish. Then add the layers as follows: half the pasta, half the mozzarella, half the ricotta, and one 1/3 of the sauce. Add the rest of the pasta, mozzarella, ricotta, and finally, sauce. Sprinkle with 1/4 cup of Parmesan. Bake for 30 min, until the sauce is bubbling. To make the sauce: Melt the butter in a heavy medium saucepan over medium-low heat. Add the flour and whisk for 3 min. Whisk in the milk. Increase the heat to medium-high. Whisk the sauce until it comes to a simmer and is thick and smooth, about 3 min. Whisk the salt, pepper, and nutmeg into the bechamel sauce. Preheat the oven to 450 degrees F. Whisk the ricotta, spinach, 1 cup Parmesan, prosciutto, egg, salt, and pepper in a medium bowl to blend. Add 1 or 2 of oil to a large pot of boiling salted water. Boil the noodles until just tender but still firm to bite. Drain. Arrange the noodles in a single layer on a baking sheet to prevent them from sticking. Butter a 13-by-9-by-2-inch glass baking dish. Pour the bechamel sauce over the bottom of the prepared dish. Lay out 4 lasagna noodles on a work surface, then spread about 3 tbl of ricotta mixture evenly over each noodle. Starting at 1 end, roll each noodle like a jelly roll. Lay the lasagna rolls seam side down, without touching, atop the bechamel sauce in the dish. Repeat with the remaining noodles and ricotta mixture. Spoon 1 cup of marinara sauce over the lasagna rolls. Sprinkle the mozzarella and remaining 2 tbl of Parmesan over the lasagna rolls. Cover tightly with foil. Bake until heated through and the sauce bubbles, about 20 min. Uncover and bake until the cheese on top becomes golden, about 15 min longer. Let stand for 10 min. Meanwhile, heat the remaining marinara sauce in a small saucepan over medium heat until hot, and serve alongside. Tossed Lasagna.- Another variation of the classic also easily adaptable for everyone! Heat large pot of salted/oiled water to boiling over high heat; add lasagna noodles and cook about 12 to 14 min. Meanwhile, in nonstick 12-inch skillet, heat oil over medium heat until hot. Add onion and cook 10 min or until tender, stirring occasionally. Add garlic and cook 30 seconds, stirring. Stir in tomatoes with their juice, pepper, and 3/4 tsp salt, breaking up tomatoes with side of spoon; heat to boiling over high heat. Reduce heat to medium and cook, uncovered, 8 min. Add spinach and cook, covered, 10 min or until spinach is tender, stirring occasionally. (you can use cooked chicken, tuna or your choice here too)Stir in basil. Drain noodles, return to pot. Add tomato mixture and Parmesan cheese; toss well. 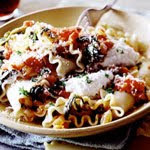 Spoon into four pasta bowls; top with dollops of ricotta cheese. Serve with additional Parmesan if you like or top with any shredded cheese like mozzarella or jack. Note: You can also make a meat sauce and use this as well, works great! Assemble the salad: Tear the lettuce into a large bowl. Add enough dressing to coat the salad to your liking. Add some extra Parmesan and toss the salad well. Serve immediately. You can also add croutons, grilled chicken breast or steak strips, mushrooms, sliced tomatoes, red onion or anything else you like in your salad. Use special shell-shaped Madeline molds that have been buttered and floured (or s mall 1 1/2 inch muffin pans). Fill molds 2/3 full; fill muffin tins less than 1/2 full. Bake in a 425 degree oven for ten min or until lightly browned. Dust cooled tea cakes with powdered sugar. Yield: 5 dozen. You can also either make or buy chocolate sauce, then dip the Madelines on one side and only the tip of them as an extra taste boost. Excellent! Once again we've planned out a lovely menu to share with family and friends, I do hope you're trying the recipes I'm posting so you too can see what my family enjoys. You'll be able to share those dishes we consider "family favorites"..... Enjoy!